The San Domenico Palace belongs to a very rare category. It is one of those very few hotels in the world in which I am entirely happy to pass a whole day without setting foot outside the property. I love ancient buildings and I adore beautiful gardens. 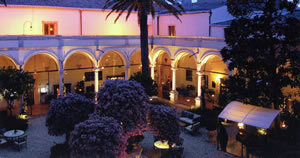 For an hotel to possess both – as does the San Domenico – makes me think that such a blessing can only be of divine origin. And that thought is particularly appropriate with regard to this establishment, for it started life in the 14th century as the home of a religious community. Yet there is even more to commend this famous hostelry. For it is located in Taormina, perhaps the prettiest town in Sicily – and Sicily has an abundance of pretty towns. It is small wonder that the guest book reads like a list of every European person of note over the past one hundred years. 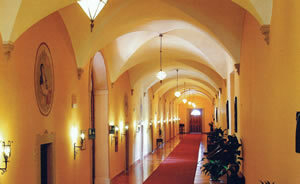 Truly, you would have to be very odd indeed not to want to stay at the San Domenico Palace. Let me attempt to describe the garden first. 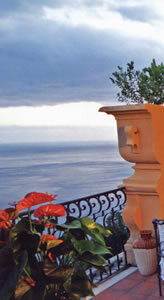 It is at the back of the hotel, and forms a vast terrace, overlooking the Ionian Sea far below. In what must surely be one of the most atmospheric spots in Europe, sunshine warms the roses and the jasmine and the orange blossom. It warmed me, too, as I wandered along the narrow pathways. 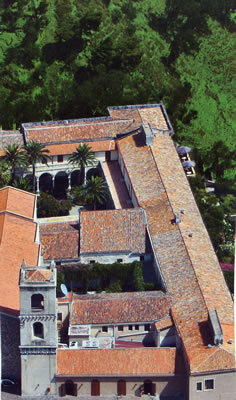 Through the foliage, were glimpses of the bell tower and of the windows of the monastic cells. I sat on a bench and looked across the hillside at the town of Taormina and its ancient glory, the Greek Theatre. Then I strolled along to the other end of the garden and settled myself on a wooden seat. From this shaded vantage-point, as the bees went about their business among petals of red and purple and gold, I gazed at the backdrop of my scene. 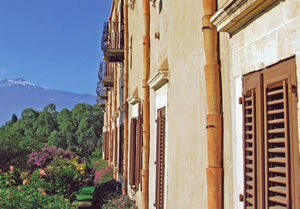 Mighty Etna, snow-capped and proud, smoked lazily in the heat of the afternoon. When the temperature in the garden rose a little too sharply, I found it wise to retreat to the larger of the two cloisters. Here, next to trees of lemon and palm and by arches of Renaissance perfection, I would order a pot of lapsang with lemon. I sipped the cup that cheers to the sound of birdsong, and thought more than once that there could be no better place for tea in the whole wide world. Arriving in a taxi from Catania airport (about 30 miles away), I was relieved to march into the entrance hall, and to admire those objects which are found throughout the extensive public rooms – pieces of antique furniture, Old Master paintings and ancient reliquaries. 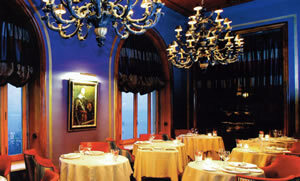 This is a place of civilized luxury, in which a distinguished history is matched by a welcoming present. My own billet was in the newer part. Room 128 was a Junior Suite, with a bed/sitting area measuring 22 feet in length and 11 feet in width. (You should check the hotel website for the prices for specific dates.) In through a small hallway, I found a spacious chamber with cream walls, a floor of brown ceramic tiles and a twelve-foot ceiling. The ceiling height increased to 15 feet for the sitting area beyond the arch, which accommodated a sofa and two easy chairs. In the yellow, tiled bathroom were Molton Brown toiletries, a tub of good size with a shower over, one wash basin, the loo and a bidet. Yet the chief glory of this air-conditioned apartment was out through the French window: a terrace, made private by high walls on either side, with a table and chairs of wrought iron, two loungers and a view to warm the coldest heart. Set out before me were the blues of sky and ocean, and – once again – the bleached red bricks of the distant Greek Theatre. I have already mentioned the extensive public rooms. They are cool, spacious and well-furnished in a traditional manner. In one of them, I came upon a framed photograph of Queen Elizabeth the Queen Mother – an unexpected delight for your royalist correspondent. You might care to know that other former guests have included Cary Grant, Kaiser Wilhelm II and the playwright Pirandello. Clearly, the San Domenico appeals to lots of different sorts of people. 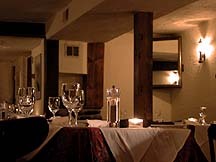 With its abundance of space, the hotel has various dining rooms. During my visit, I dined in the Antico Refettorio (pictured), an impressive space with some decent oil paintings on the walls. I sat at a large round table with a patterned tablecloth in light beige, on which stood glassware by Walther Glas and a single, tapered candle in a silver candlestick. The melodies of the pianist in the adjacent bar drifted in. In this thoroughly relaxing setting I thought I would eat well. And I did. 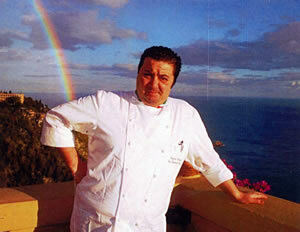 Executive Chef Massimo Mantarro (pictured) is a man who likes to serve traditional Italian food, made carefully from good ingredients. His approach is to be applauded. It provided me with meals full of pleasure. Portions were substantial and the service was both proper and friendly. 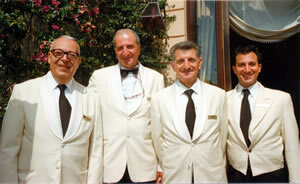 Indeed, it is only right that I present to you a photograph of four of the good gentlemen who looked after me so well at both dinner and breakfast: three share the name Giuseppe and one is Agatino. The highlights of my dinners were as follows: wonderfully dry and tasty marinated salmon (prepared in-house) with brown bread and butter, delicious Parma ham carved by the table, exceptionally good rare beef fillet with onions and fried potatoes, a brilliant rum baba from the sweet trolley and strawberries with mint flambéed next to me. (Expect to pay 100-110€ or four courses, unless you are on the half-board arrangement.) Chef Mantarro’s skills are also to be found in the smallest of the restaurants in the hotel, the Principe Cerami, which has two Michelin stars. The hotels wine list is extensive. For you, dear reader, I sat down and counted. There are 803 bottles, 66 magnums and 20 halves, and 12 wines are available by the glass. Prices range from 30€ for several local wines to 5,690€ for 1998 Pétrus. 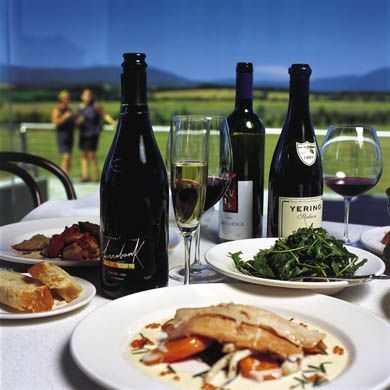 Most of the offerings are Italian or French, but the rest of the world contributes a few of its best bottles – like 1999 Grange from Australia (740€) and 2008 Opus One from California (780€). The following caught my eye: Brunello di Montalcino, Biondi Santi Riserva 1990 (1,900€), 2005 Luce (165€), 2008 Solaia (360€), 1952 Mouton Rothschild (2,300€) and 2003 La Tâche (1,600€). These, of course, are some of the more expensive offerings. 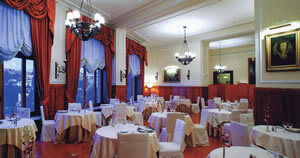 But you do not need to dig deeply into your pocket to drink well at the San Domenico. I commend to your attention, for example, the nero d’avola I tried for just 30€, which had an earthy, vegetal nose and lots of black fruit in the mouth (Il Giglio Rosso, Masseria del Feudo, 2011). My breakfasts were had on the terrace of the largest restaurant, Les Bourgainvillées, and were occasions of absolute joy. The sun shone (its rays shielded from your correspondent by a well-placed shade), the palm trees swayed, the sea below sparkled, the distant Greek Theatre glowed in its ancient majesty and all was right with the world. From the extensive buffet I took super bacon with magnificent baby tomatoes, fruit tart, croissants, pineapple, melon, scoops of refreshing coffee-flavoured granité and slices of crusty bread, and to my table were brought glasses of freshly-squeezed orange juice, pots of coffee, dishes of ice cubes and my concluding cappuccini. Thus did my days begin well. I did, of course, over the period of my visit, venture out into the pretty streets of Taormina. But there were days when I stayed within the confines of the property, happy to rest within its pampering and luxurious embrace. 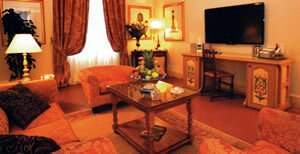 The San Domenico Palace Hotel really is that good. Piazza San Domenico 5, Taormina 98039, Sicily, Italy.